Your journeys could take you across the length and breadth of Middle-earth, from the northern wastes of Forodwaith to the deepest south of Harad. Whether you’re walking among the ancient kingdoms of Arnor, greeting the Horse-lords of the Riddermark, sailing the Bay of Belfalas, or approaching the city of Dale beneath the Lonely Mountain, the Middle-earth Gamemat offers a beautifully detailed map of Middle-earth, picking out forests, rivers, mountain ranges, countries, and key locations. 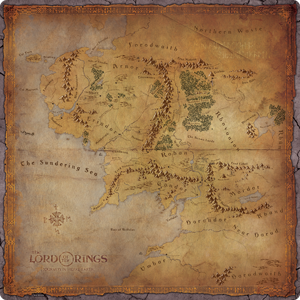 Your games of Journeys in Middle-earth may see you roaming Middle-earth on the journey map, employing double-sided tiles to build out a larger region for your adventure to take place. Or, for a more tactical or combat-oriented adventure, you may turn to the battle map, zooming in on a tiny piece of Middle-earth, such as a ruined fort overrun by the forces of Mordor. No matter which map you’re using, the Middle-earth Gamemat offers a secure foundation as a slip-resistant, 3’ x 3’ rubber mat that’s perfect for your unfolding adventures. 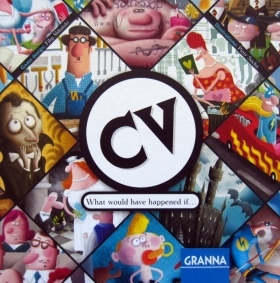 In The Staufer Dynasty, the players are nobles in the 12th century, accompanying Henry VI on his tour of the areas of Europe brought under control by the Staufer family, an area that included much of modern day Germany, went from the Baltic Sea in the North to Sicily in South. 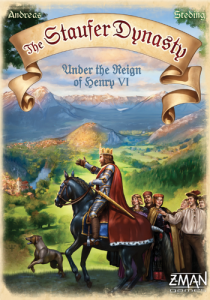 You're eager to improve your own lot in the land by placing envoys and nobles in positions of power in the six regions represented in this game. 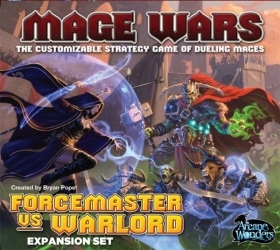 Mage Wars: Forcemaster vs. Warlord is the first two-mage expansion set for Mage Wars, focusing on two schools of magic not emphasized in the core set: the Mind School and the War School. The Forcemaster is a master of telekinetic force and mind magic, while the Warlord is a master of the art of War, trained in both the War and Earth schools of magic.